CDG Certification Limited provides WRAP certification, WRAP audit services in Delhi, Mumbai, Kolkata, Chennai, Bengaluru, Hyderabad & all parts of India. As per the precise requirements of the customers, we are offering a wide array of WRAP Audit / WRAP Certification to our prestigious clients. WRAP include compliance with Laws and workplace regulations, freedom of association and collective bargaining, prohibition of harassment or abuse, prohibition of discrimination and prohibition of forced labor. WRAP is an independent, non-profit corporation dedicated to the promotion and certification of lawful, humane, and ethical manufacturing throughout the world. 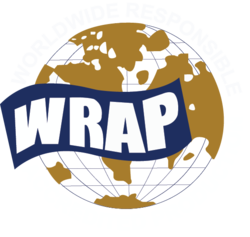 Set up in 2000, WRAP is the world’s largest labor and environmental certification program for labor-intensive consumer products manufacturing and processing. WRAP is supported by 25 international trade associations, including the International Apparel Federation, which represents 36 national associations and over 150,000 individual companies. WRAP was formed out of the desire to create an independent and objective body to help apparel and footwear factories around the world verify that they are operating in compliance with local laws and internationally-accepted standards of ethical workplace practices. We trace our origins back to the mid-1990s when reports surfaced of sweatshop-like conditions in numerous apparel factories around the world, including excessive working hours, unsafe conditions, and the denial of several legally-mandated benefits to workers. Recognizing that such a scenario could jeopardize the apparel industry as a whole, the American Apparel Manufacturers Association (now the American Apparel and Footwear Association) moved to coordinate an industry response to the issue. A task force was formed which received input from a variety of stakeholders including brands, suppliers, NGOs, academia, and government officials. Based on their findings, the task force recommended the creation of an independent third-party organization free of government or corporate influence that could identify and reduce the prevalence of sweatshop conditions in factories around the world. Backed by a team of highly experienced professionals, we are offering a broad assortment of WRAP Certification Services In India to our customers. WRAP is a trusted independent supply chain partner for dozens of companies. Offered services are executed under the supervision of highly experienced inspectors of quality to ensure flawless service to the customers.